Don’t add the butter too early, as the recipe says cook the 1st side in just oil then once the schnitzel is turned add the butter at that stage, this will prevent it from burning and leaving little black flecks all over your crust. Coat the Pork in seasoned flour, then the egg, and then panko crumb. Heat a large pan over high heat. Add canola oil and schnitzel, cook on one side until golden, turn and add in butter, cook again until golden. Drain on a paper towel. Combine together the mayonnaise, soy sauce and vinegar. Dress the remaining coleslaw ingredients. 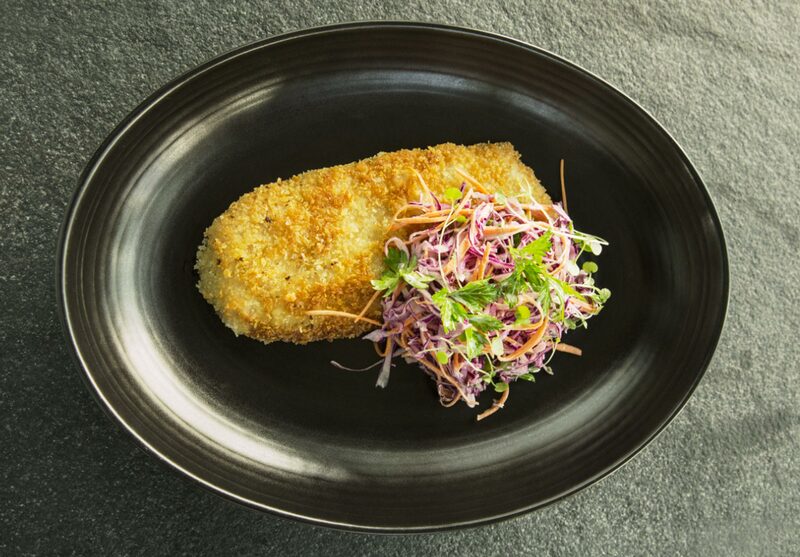 Place the schnitzel on the plate with the coleslaw and watercress.